Celtic manager Neil Lennon says he is not concerned by other managers being linked with the long-term job at Parkhead. Lennon was appointed as manager until the end of the season when Brendan Rodgers departed for Leicester in February, and his side have won five of their seven games in all competitions since, with the two other fixtures resulting in draws. Even though they have moved 11 points clear of Rangers in the Scottish Premiership, and remain on track for a third domestic treble in three seasons, Celtic have been linked with bringing in Roberto Martinez and Andre Villas-Boas next season to replace Lennon. This Sunday, Celtic face Aberdeen in the semi-final of the Scottish Cup - the same side they beat in the final of the League Cup in December - knowing a win would take them one step closer to the tremendous 'treble-treble' achievement. However, Lennon says he does not know if victory will help his cause to stay. "I've no idea," he said. "Everyone is speculating and it's all conjecture. It's all noise. All I can do is just focus on the games. "Two weeks ago, we were playing Rangers, and seemingly everything hinged on that result, and now it's the next one. "So it's all noise as far as I'm aware." 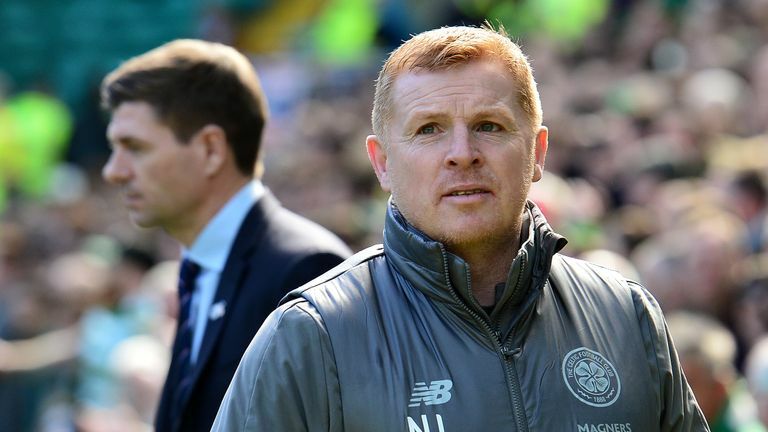 Despite the team's success under the Northern Irishman, Lennon is not surprised other managers have become the bookies' favourites to land the job long-term. "You can't stop it," he said. "It's natural. The club may want to go down that road. "They'll make a decision. It's their club, it's the fans' club, and it's important for them that going forward they're happy with what they're doing." After their cup match with Aberdeen, Celtic have five league fixtures remaining, and if they reach the Scottish Cup final, they will play on May 25.